Camp Forrest in Tullahoma, Tennessee, was one of the U.S. Army's largest training bases during World War II. Little remains of the camp today. Founded in 1926 as a 1,040-acre summer training facility for the Tennessee National Guard, Camp Peay was named in honor of Tennessee's sitting governor, Austin Peay. 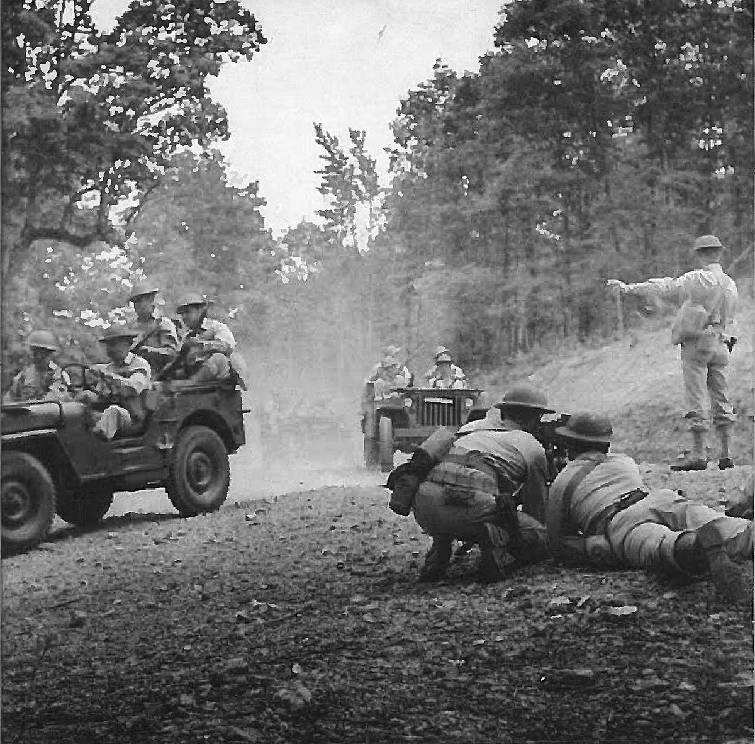 With the onset of World War II, Tennessee officials encouraged the federal government to expropriate Camp Peay and transform it into Camp Forrest, a federal Army training and induction base. In honoring Gen. Nathan Bedford Forrest, one of the Confederacy's most celebrated leaders and the controversial founder of the Ku Klux Klan, the War Department followed a standard practice of naming its installations after military leaders from the local state. Following the German invasion of Northern Europe in spring 1940, Camp Forrest began expanding. By March 1941, its 85,000 acres included 1,300 buildings, 55 miles of roads, and five miles of railroad tracks in a mid-sized city of 75,000. That same year the Army began construction of the 30,619-acre Spencer Artillery Range for use by heavy artillery and infantry units. In June, Gen. George Patton brought his 2nd Armored "Hell on Wheels" Division from Fort Benning, Georgia, for training maneuvers. The 2nd Ranger Battalion, formed at Camp Forrest in April 1943, practiced rappelling and climbing the crags at the Rocky River Gulf. Those rangers won fame in scaling the 90-foot bluffs at Pointe du Hoc between Utah and Omaha beaches during the Normandy Invasion. William Northern Field, an air training base located just north of Tullahoma, became a school for B-24 Liberator bombers and observation plane pilots. Civilians in the area had to adjust to blocked roads, traffic jams, crowded stores, the absence of mail delivery and driving at night without lights. Property owners sought financial compensation from the federal government for damages caused by maneuvers. Loud noises from war games often caused hens to cease laying eggs and cows to stop producing milk. At its height Camp Forrest included a post office, library, chapel, barracks, offices and NCO service facility as well as a swimming pool and sports arena. Army Rangers received training in house-to-house combat at a German mock-up village built on the outskirts of the camp. In 1942 the camp transitioned from an induction and training facility that processed 250,000 soldiers to an enemy alien camp housing several hundred Japanese, German and Italian civilians. Most were U.S. citizens. In mid-1943, the facility became a prisoner of war camp. First to arrive were about 1,500 Germans. Italians followed. Housed in poorly insulated small huts, the permanently "stationed" prisoners harvested local crops, processed pulpwood, unloaded supplies at train depots and produced camouflage nets. POWs had access to medical and dental facilities at the camp and were offered courses in U.S. history, geography and English. Prisoners put on theatrical productions, played in a band and produced a newspaper. There were 30 escape attempts in which one POW was killed and the rest were recaptured. About 24,000 members of the Wehrmacht, the unified armed forces of Nazi Germany, had been held at Camp Forrest during the war. When World War II ended in 1945, farmers begged the camp commander to delay repatriation of prisoners until after harvest season to offset a labor shortage. The federal government soon declared both Camp Forrest and Northern Field surplus property, and auctions were held to dispose of the buildings, water, sewage and electrical systems. A few decaying chimneys, concrete slabs and impact craters stand as silent monuments of one of the largest induction, training and POW camps of World War II. The local community erected a newer monument commemorating those who served at Camp Forrest. President Harry Truman dedicated in 1949 what became the Arnold Engineering Development Center (AEDC) honoring five-star Gen. Henry "Hap" Arnold, World War II commander of the Army Air Corps, commonly referred to as the father of the Air Force. Arnold's vision was to create a development center to ensure the U.S. Air Force would be second to none. AEDC remains true today to Arnold's vision in conducting developmental testing and evaluation through modeling, simulation, and ground and test flight test —a long journey from Camp Peay, the Tennessee national guard camp of the 1920s. Jerry Summers is an attorney with Summers, Rufolo and Rogers. Frank "Mickey" Robbins is an investment adviser with Patten and Patten. Elizabeth Taylor's informative "Camp Forrest," Arcadia Publishing, with its photographs was an important source for this article. For more visit Chattahistoricalassoc.org.